Welcome to the first Pals Paper Arts Challenge of 2012! How will you choose to play along? You have until Thursday, January 12th to upload your creation(s). 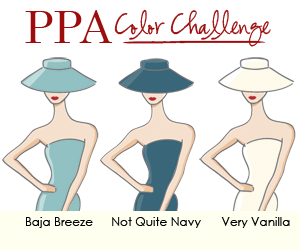 The PPA Design Team invites you to play along using YOUR favorite products! Most people need 'Thank You' cards right after Christmas, so that is what I've made for this week's challenge. I loved playing with the new Framelits dies from the Occasions Mini. Here I one of the sizes on a piece of smooth Baja Breeze card stock for the sentiment from Thank You Kindly. Then, to frame my sentiment, I used a larger die size and cut it out of textured (Snow Burst embossing folder) Not Quite Navy card stock. I could not photograph this card to show it, but I used my Snowflake punch to cut out part of the Baja Breeze framelit and then glued my actual snowflake into the punched out area. It looks like shadows on the photo. You wouldn't HAVE to do this, but I was trying for a certain look. Not sure I really got it, though! I glittered my snowflake using Dazzling Details in clear. I even glittered the slice of card stock that I used to "tie" my Twitterpated button, which is adhered using a glue dot. 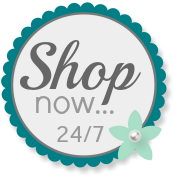 I hope you liked looking at my card today and that if you would like to order Stampin' Up! products you will use my website. I love it....I especially love the way that you tied off the ribbon, so beautiful. The sparkly snowflake is perfect for a holiday thank you! Wonderful details - love the ribbons and those buttons are adorable - especially with the teeny pearls~! Blues are great for wintery cards and you used them perfectly, Patti. Love your ribbon detail across the bottom! Love the way you've used the Framelits dies, Patti! Neat idea to punch out part of the snowflake too! Love the sparkle on the snowflake! Beautiful card! With lace, button, ribbon, and PEARLS...what can I say? This card is STUNNING! Great job, Patti!